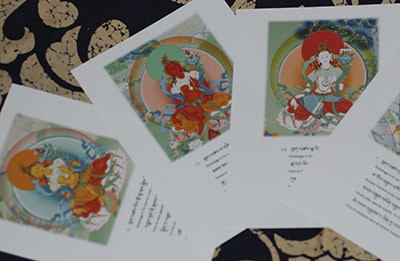 The size of the each page is A5 and there will be Tibetan verses from "The praise to the twenty-one Taras" with phonetic and translation in French, English or Japanese. My friend, a Khenpo suggested me to put also the translation but the translations are protected by copyright so I can't just choose one from some book or internet and use it for the book. It is also difficult to choose which translation to use. Because the depiction of the twenty-one Taras on the Thangka vary depending on the leneage or school. 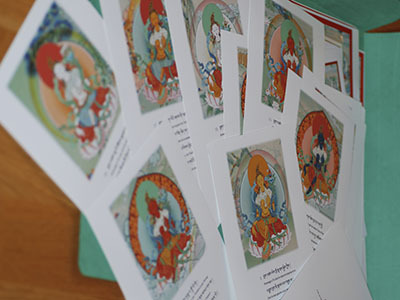 The one I painted this time is the twenty-one Taras of Lonchen Nyingthig tradtion but even in this same tradtion there are several differences in the dipiction. Maybe it is better to not put the translation but leave some area on the page empty for it. So that people can write what they learn from their teacher following to their tradition....is what I thought. But no, Khenpo's suggestion must be right. I don't know, for practionner, how important the small details in color or depiction are. But at least it's fun too see the all deferent images of Taras while we are chanting the praises and I believe it will help to visualize it till you see even more beautiful Taras front of you through your meditation. thankas were convert from pauva, in anccient nepal newars used to paint it to describe the story about particular subject of particular god or goddess.After incarnation of guru padmasammavov( one of newar} this art is carried to tibet through Buddhism. Hi. Yes, I know pauva and I like very much the Newari Thangkas. They are so detailed and beautiful. Do you mean Guru Padmasambhava, maybe? It's first time to hear that Guru Rinpoche was Newari.